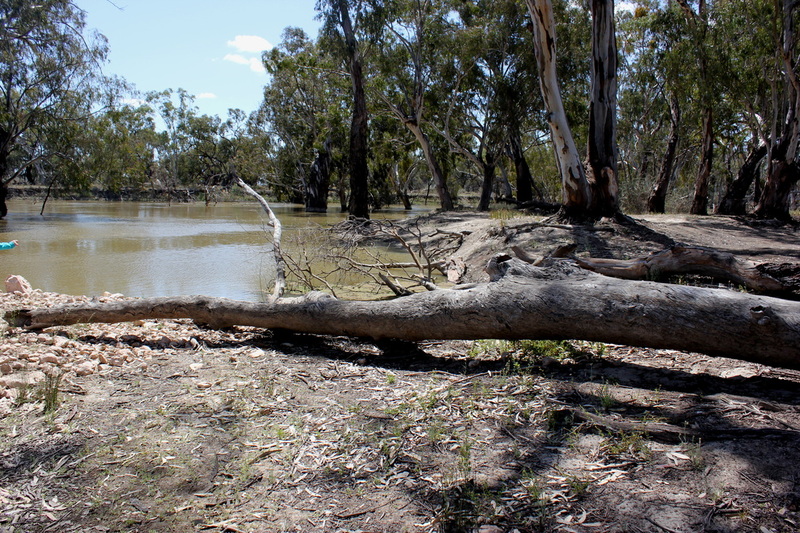 Chowilla Game Reserve is around 32km from Renmark (3-3.5 hours from Adelaide, very close to Victorian and NSW borders). 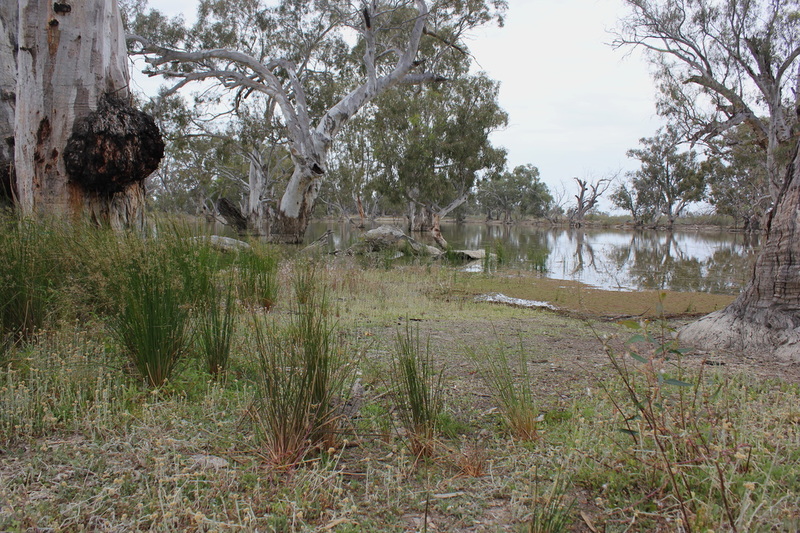 The reserve is an integral part of the Riverland Biosphere Reserve and comprises 18,000 hectares of floodplains and wetlands. From Renmark take Ral Ral Road to Wentworth Road, and drive 23km on a dirt road to the Reserve which is signposted. This road seems to take forever. Watch out for all the Shingleback Lizards on the road, so go nice and slow. From there, find a campsite that suits. As you drive along the dirt roads, the thing that stood out to us, was how dry and barren the landscape away from the River is. Low lying shrubs, dead trees and barren land was all around, and its not until you are right next to the river, that this area truly becomes a great place to camp! Don't be put off by the initial drive into the area. Its very much like the initial impressions of Katarapko. Based on this change, some of the information listed below may not be as relevant. At time of visiting (and writing), the popular campground of “Little Gums” was closed, as were campsites 1-8. We have not reviewed these sites. The rest of the campsites are spread along the River, and their outlook varies wherever you are. We found campsites 9-12 to be less appealing with their outlook, and campsite itself. Campsites 13 and upwards were more interesting and better suited for us as a family (and with a kayak). The sites are so far apart from each other, you would NOT know that there was anyone in the park. I would say that for some sites, it would be 1-2km between them. Overcrowding would not be an issue. The sites vary, but all we visited were large and had differing amounts of shade offered by large gum trees. Camper trailers should not have trouble finding a level area to set up, though some of the road to the campsites was narrow and bumpy, and one caravan we saw decided that the road was no longer suited to him, and pulled over and camped where the road got too difficult. We visited in school holidays – a traditionally busy time. We were the only ones there for the first few days, and then only saw the aforementioned caravan and one other group. We camped in total isolation and silence (except for the incredible amount of noise generated by birds,frogs and insects at night – amazing). There are no toilets. Parks SA website says there are some, but where and near what campsite, we don’t know. We visited many campsites, and saw nothing that looked like a toilet. Lucky we had a chemical toilet, and I strongly suggest that if camping by in this area, you bring one. The only water is that of the River, so sterilisation is recommended before drinking. Fishing, canoeing, kayaking, and relaxing by the River is what this spot is all about, and it is a perfect place to do this. We, once again, caught only carp and a few yabbies. Carp of course, cannot be put back into the River. The yabbies did go back! Big goannas in this area, which was exciting for us to see. Give them plenty of space, and they won't bother you. Definitely a great spot to unwind and relax. This part of the River is very shallow, so you don’t get big boats or water skiers, and because it’s a little further to get to, I think that keeps the crowds away. But it is worth the effort.